China World Fibre Report 2013, Polyester Filament Yarn, Viscose Filament Yarn. 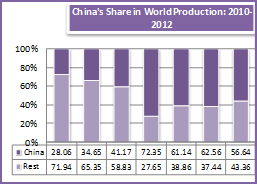 China dominates the textile industry and is the single largest producer and consumer of all types of fi-bre/filament. The largest importer of acrylic staple fibre, nylon, and cotton.